AFRIKA KOMMT! 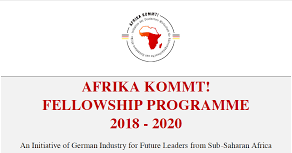 is an initiative of leading German enterprises for future leaders from Sub-Saharan Africa. The fellowship programme aims at highly qualified young professionals and junior executives from countries in Sub-Saharan Africa with several years of work experience, strong leadership qualities and a high level of commitment and dedication.